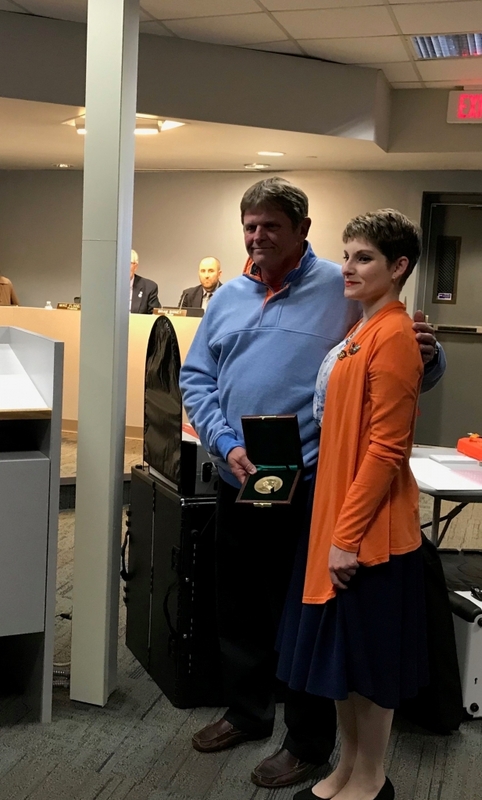 Carnegie Hero David Moen poses with the woman he saved, Kymberly A. Dominguez, after he was presented the Carnegie Medal by Orion Township (Mich.) Supervisor Chris Barnett at the township’s board meeting on Oct. 1 at the township hall. On June 28, 2017, Moen, 64, of Lake Orion, Mich., rescued neighbor Dominguez, 29, after an explosion occurred on the first floor of her home and caused portions of the house to collapse. Moen stepped through a second-floor window that had fallen to ground level and entered the unstable, burning home calling for Dominguez. About 10 feet from the window, Moen met Dominguez and carried hero outside to safety over broken glass and other debris. Aware that Dominguez’s parents remained inside, Moen made efforts to re-enter the home, but the instability of the structure and intensity of the fire thwarted his attempt to rescue them. Dominguez’s parents did not survive, and Dominguez was treated for bruises and scrapes, but she was not burned.